The detail of his life and teachings are shared on the occasion of Tsulchen Rinpoche’s upcoming visit to Thailand during December 13-23, 2017 to give teachings, and oral transmissions as well as chair the Phapa offering ceremony for the World Peace Great Stupa under construction at Kundrol Ling, Thailand. This biography of Tsulchen Rinpoche is compiled from a collection of teachings by Tsulchen Rinpoche as well as an interview with Ajarn Meu Yonten, who spent 27 years at Tokden Monastery under guidances of Tsulchen Rinpoche and the late Triwa Rinpoche. The Nature Body is empty like the sky. The Perfection Body is radiantly clear like the sun and the moon. The Emanation Body is colorful like rainbows. Many thanks to Boe Norbu Dawa for the lovely poster. 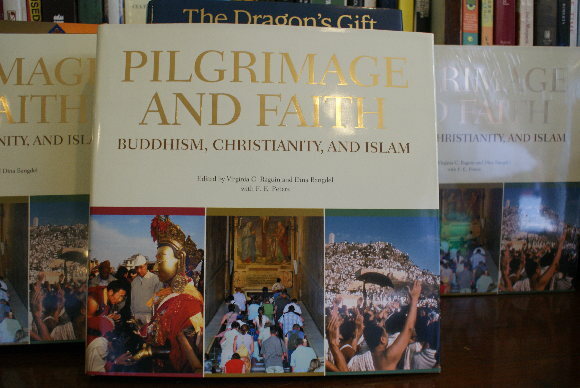 Pilgrimage and Faith: Buddhism, Christianity and Islam explores pilgrimage as experienced in Buddhist, Christian and muslim faith communities. It addresses shared goals of personal development and communal solidarity as deep human needs. Unique in scope, this richly illustrated catalogue addresses religious diversity in a global perspective. There is an article “Journey of the Heart: Prostrating on the Roof of the World” by Dr. Krisadawan Hongladarom in this volume. 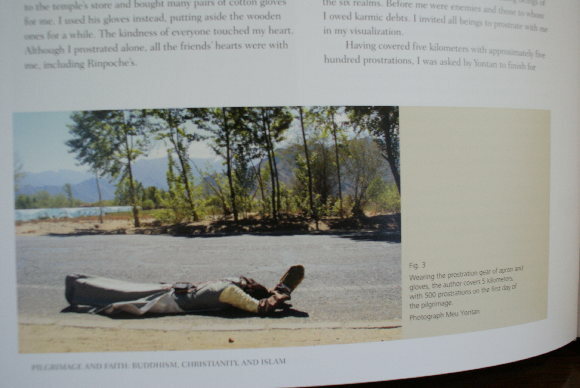 This is the first time her experience as a prostrating yogini is shared in an international circle. The Foundation thanks the editors and the publications for taking part in preserving the world’s ancient traditions of pilgrimage. We are grateful to the publisher Shane Suvikapakornkul for supporting the foundation’s activities by presenting us 50 copies of the volume. Today I was thinking about “attachment,” one of the five poisons. Even those who call themselves “practitioners” fall in its trap. They are attached to merit-making. They wanted to get more merit than others. They think by serving masters they get more merit than those who do not serve them. And they are jealous that others may get more merit than they do. Some are attached to the “dharma work” they create and this make them difficult to let go or even to die peacefully. When we become practitioners, don’t let practice fake us. Attachment comes in various forms and sometimes it looks very much like merit itself.